He strives to completely lift the veil that covers the state, and he does so not through rhetorical bombast or libertarian theorizing but through careful, fact-filled argumentation on the issues that most people think about. The success of the book owes something to its extremely creative organization. Woods begins with the general theme and jumps straight into the big issues that are being debated right now. The first target is health care, and here he goes back to the beginning of government involvement and takes us straight up to the present, showing that the entire sector is half-socialized as it is and it is precisely because of this that there are so many problems. Then he demonstrates the gross error of proceeding further down the socialist path, and argues for repealing the existing apparatus, not in the way that Republicans are imagining but in a way that goes beyond what anyone in public life is willing to say. This sets up the model for the book, and this model is then applied to the economic stimulus packages and counter-cyclical policies the government has used to deal with the great recession. Here we see the full Austrian perspective in glorious display. This pattern is extended to the chapter on the Fed, which ends up being a sweeping attack on all forms of central banking and government monetary policy. From here we move into the surprising area that is sadly neglected in reformist literature: the military. He treats the bureaucracies, programs, and policies as another species of interventionist practice, no different in its operations, dynamics, and effects than any other government program. It lives parasitically off the productivity of the people, draining capital and killing innovation, plus wrecking lives. He adds an interesting twist here by demonstrating that there does exist an anti-militarist strain within American conservative thought; his goal here is simply to extend and apply that strain. After this, we come to the real meat of the book, and the most challenging part. Woods debunks the myth of good government and makes clear that the goal of all reform must not be to make government work better but to disengage it completely from society and economic life. Whereas the previous sections might have educated many readers on facts that they did not know, this section, the largest of the book, deals with the core of the American civic religion. This is also where the scales being to fall from the eyes. His point is that there is nothing that the government does that improves our lives relative to how freedom might handle the same issue, that there is nothing that needs to be done in society that freedom cannot do better than bureaucracies. Now, obviously, this section represents a dramatic departure from every political convention. It takes us out of the framework of “limiting government” and into the area of radical freedom. The value added here relative to a philosophical book on anarchism are the specifics that are up to the minute in current affairs. He puts meat on the theoretical bones of the case for living without government. We might say that this is the people’s case for orderly anarchism. 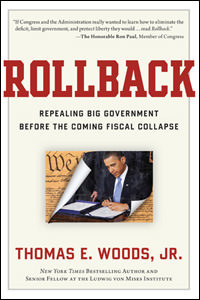 It is for this reason that Rollback isn’t really the right word, in fact. It is really about eliminating the federal government as we know it. In this sense, the book is rather mind blowing. Woods draws on every resource, and the best resources too, to make the case, and never shrinks from taking on the really hard issues. He is a serious scholar with an editor’s strategic sense. He knows what issues to discuss and he knows the best arguments to explain them from the point of view of freedom. In so doing on issue after issue, he helps the reader imagine life without power. Woods addresses a huge range of topics here: unemployment, health care, social security, the Fed, regulation of business, the drug war, military build up, labor regulations, government spending, debt, protectionism, and much more. In each case, he lays out the terrible results of government policy and the prosperity-creating advantages of rolling back every aspect of each. Also note that this prose is extremely pithy, packing in outrageous amounts of information and argumentation in a short space. With his thousands of specifics, he demonstrates that radical liberty is not just a beautiful theory; it is a beautiful and essential practice. I can easily see this book as this generation’s Common Sense: a book that enlightens and emboldens people to see the practical urgency of liberty in our times and in our world. While the cover may seem tame and boring, this book is anything but. I have read the majority of Woods' books and this is his best. Jeff Tucker mentioned how he would compare the arguments in this book to an onion, getting deeper as you get into each layer. This view is correct. The book starts by attacking the state on simple issues that conservatives and libertarians can agree on such as intervention into healthcare. As you get further down the rabbit hole though- BAM! - Woods pulls no punches on the sacred cow of conservatism; the military. One of the best pieces that I have read during my venture into libertarianism has to be the chapter "the Myth of Good Government," which further shatters the conservative world view. Woods claims that he won't write another book for a while until his other works, such as Rollback, are reaching and being read by more people, so, for the love of all that is good, buy this book [or a few copies] and read it. You will not regret it. from Virginia Tom Woods At His Best - A MUST Read!!! This is an absolutely DEVASTATING assault on the status quo that will have even the most ardent supporters of the state grasping desperately for their ideological blankies - too bad for them, Tom Woods ripped them to shreds and threw them in the fire. After showing in frightening detail how utterly unsustainable and financially destructive our current path is, he goes down the line looking at all of our most pressing domestic problems and shows PRECISELY how government intervention - whether by the Federal Reserve System, regulations or other - is responsible...not that Unicorn of today's economic world, the totally unregulated Free Market, which always seems to receive the blame. He then finishes by refuting every myth, rumor and false notion that have come to form the ideological support structure for the state as it exists today, which are supported by no facts and yet are believed by almost everyone(in no small thanks to government-run schools that have no conflict of interest).